First of the new year with movies from the new year, keeping up the one-per-day pace. Kind of liking the layout of this year's planner, too. 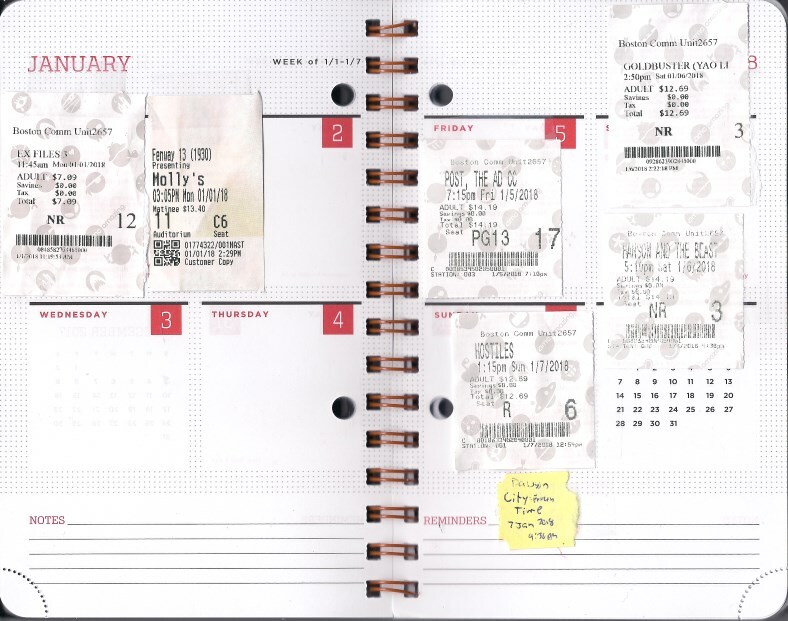 It's smallish, but the layout works pretty well if I keep to one stub a day, with some extra room around the weekends. Considering how most of these calendars are made to organize work rather than play, there aren't a whole lot that cater to my desires. As for actually getting full reviews done for the lot of 'em... Well, blame the cold (apparently a warm computer on your lap makes a dent in the chill) and a wasted day at work on the 8th as I waited for tech support to fix something and writing on my Chromebook was a good way of looking busy. It would have been nice to open the year as well as I ended 2017, but even if Molly's Game had been as good as I'd hoped, the holiday/winter/Red-Line-generally-sucking-lately got me into Park Street too late for that, so I flipped the day's planned order an saw Ex Files 3 first. It was not good, and Molly's Game sagged in my head as I left the theater. Work didn't line up with showtimes for the next couple of days, and I just wan't setting foot outside during the "bomb cyclone" on Thursday. Indeed, it probably wasn't a great idea on Friday, but a couple days indoors will get you stir crazy and there was new Spielberg/Streep/Hanks, so The Post it was. Saturday wound up being a split-admission double feature of similar films, with Goldbuster & Hanson & the Beast not only both being goofy supernatural-tinged comedy/adventures from China, but they were splitting the same theater at the Common, meaning, yeah, I saw one, went downstairs, bought a ticket for the other, and came right back. The next day's double feature was split across the river, with Hostiles at Boston Common and Dawson City: Frozen Time at the Brattle. They paired surprisingly well, though, from overlapping time periods to audiences maybe not being as patient with them as they could be. So, there's week one down. As always, quicker updates on my Letterboxd page and a busy week ahead.